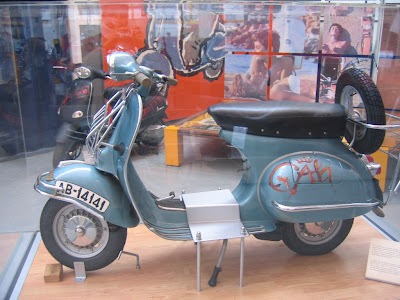 In the summer of 1962, the vehicle that has since become probably the world’s most valuable Vespa carried two Madrid University students, Santiago Guillen and Antonio Veciana, on a tour of Europe. 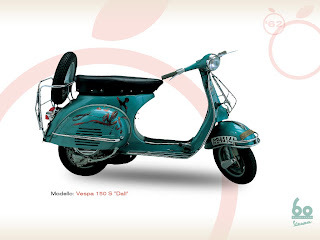 Hence this scooter entered the annals of history, becoming a true myth for Vespa fans. Found and restored (without however touching the parts decorated by Dalì), the Vespa quickly drew interest from several museums. After a first outing in the summer of 1999 to the annual Eurovespa rally, held that year in Girona, Spain. The scooter was on display at “The Art of Motorcycle” exhibition with which the Guggenheim Museum of New York inaugurated its Bilbao museum. The Vespa Dalì’s last international outing took place in 2000 at VespArt, a London exhibition. Subsequently, the exhibition’s eight Vespas decorated by eight British celebrities including Duran Duran lead singer Simon Le Bon were auctioned for charity at Sotheby’s.